A drift of Summer Beauty alliums harmonizes with a clump of echinacea. Photo by Jill Selinger. Taken from The Know Maintenance Perennial Garden© Copyright 2014 by Roy Diblik. Published by Timber Press, Portland, OR. Used by permission of the publisher. All rights reserved. Upon seeing globe alliums for the first time, many a gardener will say, “Gotta have some of those in my garden.” And then she learns that globe alliums are bulbs — and must be planted in fall. Sadly, it’s too late for this year, but put it on the list for fall: “Buy allium bulbs. Lots of them.” In the meantime, there is a way you can get alliums this year. Consider a lavender-flowered variety called Summer Beauty, which blooms later in the summer. It’s not as showy and tall as the fall-planted bulbs. However, it has arching green foliage that looks great all season. What’s more, the seed-heads hold up into the fall as the foliage ages gracefully to gold and yellow. Summer Beauty is a no-nonsense plant that finds a home in most of my garden designs. If your garden center doesn’t carry it, ask them to order it. This plant is a winner! Summer Beauty also makes the list of favorites from garden designer and nurseryman Roy Diblik, author of the Know Maintenance Perennial Garden. Even if you have a brown thumb, you can successfully grow Everlasting Alliums. They’re hardy everywhere and always in bloom. Echinops: Globe thistle blooms blue in summer. Agapanthus: Tender lilies of the Nile are showy, tropical plants that can be overwintered indoors in cold climates. Eryngium: Also known as sea holly, this spiky plant tolerates dry conditions. David plants alliums in gardens throughout northwestern Vermont. Succession Planting with Flowers? Sure! Do you sell these or where can I buy some? If you’re asking about the allium bulbs, we don’t sell them but you should be able to find them in early autumn at your local garden center or online. 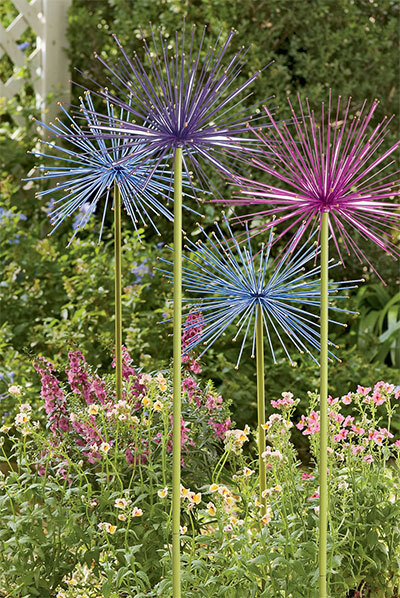 As far as the Everlasting Alliums garden art, we no longer sell these but we do sell a similar product called Allium Sunburst Stakes. 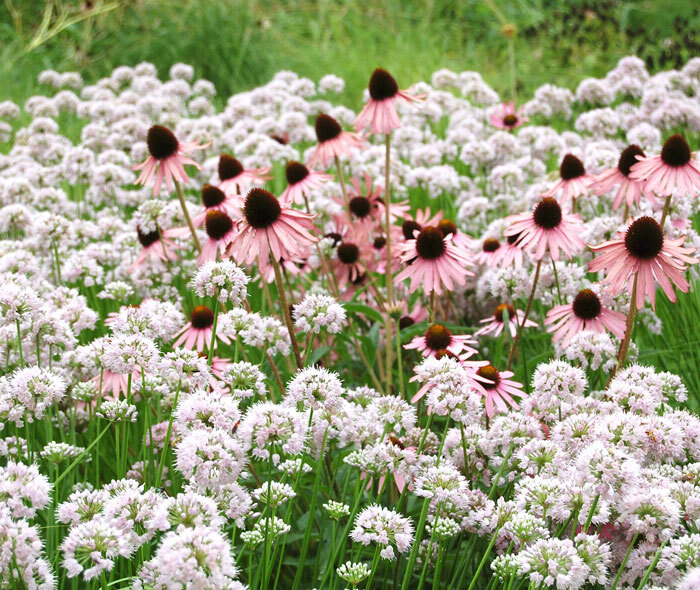 –Suzanne DeJohn, Gardener’s Supply Co.
What is the name of the echinacea? It is so beautiful! This photo was taken a few years ago but it looks to be a Purple Coneflower, Echinacea purpurea. We hope this helps!